Commodore Fluffington??. Be careful, Commodore Fluffington. I think the east mural bunnies are planning a violent uprising! lol. 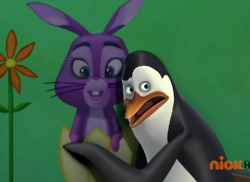 Wallpaper and background images in the Kowalski club tagged: kowalski the penguins of madagascar madagascar penguin smart one.